TS Junior Lecturer Hall Ticket 2019 is Out. The TS Gurukulam Junior Lecturer Hall Ticket 2019 released by the Telangana Residential Educational Institutions Recruitment Board (TREIRB) at the treirb.telangana.gov.in. The TREIRB authority is going to conduct the TS Junior Lecturer Examination on 16th, 17th, 18th, 19th, 20th February 2019. For this purpose, the officials issued the TS Junior Lecturer Admit Card on 7th February 2019. Competitors have to attend for the written exam on the scheduled date along with TS Gurukulam Junior Lecturer Hall Ticket 2019. Candidates can download the TS Gurukulam JL Call letter 2019 from the given link at the end of this page. We have mentioned the other information related to the TS Gurukulam Junior Lecturer Hall Ticket 2019 like details in admit card, essential documents for the exam, importance of the TS Gurukulam Junior Lecturer Hall Ticket 2019, and process to download the admit card in the below sections. The contenders who had registered for the Junior Lecturer in the Telangana Residential Educational Institutions Recruitment Board before the end date, those are eligible to download from the official website. The organization officially uploaded the admit card or hall ticket on the site 10 or 15 days before the examination date. Candidates need to download the Hall Ticket by entering the Registration ID, Date of Birth details. At the end of this page, we have given a direct link to download the TS Gurukulam Junior Lecturer Admit Card 2019. Candidates should use that link and get the Admit Card quickly. 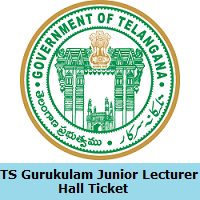 The TS Gurukulam Junior Lecturer Hall Ticket 2019 is available now to download. The Telangana Residential Educational Institutions Recruitment Board released the TS Gurukulam Junior Lecturer Admit Card 2019 for eligible candidates through the website. Candidates must need to download the admit card at least one week before the exam and have to cross-check the details in it. If applicants find any corrections immediately inform the management. After the completion of the examination process, the result will update soon on our website Sarkari Recruitment. The candidates must maintain the admit card safe up to the announcement of result from the organization. To view the result applicants needs the details in admit card or hall ticket. For more updates about the TS Gurukulam Junior Lecturer Hall Ticket 2019 click on our website. The examination board will not permit to write the exam without admit card or call letter. Through the hall ticket, the management will easily find fake candidates in the examination hall. The TS Gurukulam Junior Lecturer Hall Ticket 2019 has essential information like Name of the Contender, Photograph of the candidate, Exam name, Exam Center Name, Exam Center Code, Exam Center Address, candidates Address, Mother or Father Name, essential instructions for the examination. Aspirants need to carry any identity along with the admit card for security reason at the examination center. After the examination time, the students will not allow into the examination center. Every candidate should attend in 20 minutes before the exam and check the details of examination instructions behind the admit card before starting the exam. Go to the organization website of Telangana Residential Educational Institutions Recruitment Board, treirb.telangana.gov.in. Search for the TS Gurukulam Junior Lecturer Hall Ticket 2019 for the Junior Lecturer position. Click on the TS Gurukulam Junior Lecturer Admit Card 2019 download link. TS Gurukulam Junior Lecturer Hall Ticket 2019 will display on the screen. Download the TS Gurukulam Junior Lecturer Hall Ticket 2019. Check the information in the admit card. Take a xerox copy of the hall ticket. Submit TS Gurukulam Junior Lecturer Hall Ticket 2019 at the examination center with an identity.